The objective of this study was to study the pre-operative characteristics, outcome, and postoperative complications in patients undergoing vitrectomy for ADED and to identify factors that predict poor visual outcome. A retrospective study was conducted in the ophthalmology department of Hospital Tuanku Jaafar Seremban, a vitreoretinal referral centre in Negeri Sembilan, Malaysia. The charts of 168 consecutive patients who underwent vitrectomy for ADED between January 1, 2011 and December 31, 2013, were reviewed. These patients underwent standard 20G or 23G pars plana vitrectomy with a combination of delamination and segmentation by a single surgeon. All the patients had post-operative follow up of minimum 1 year. Data collected included baseline demographics, pre- and post-operative best-corrected visual acuity (BCVA), indication for the procedure, post-operative complications, anatomical and visual outcome and duration of follow-up. Additional information included a combination of phacoemulsification and sequential cataract surgery after vitrectomy. Each patient underwent best corrected visual acuity (VA) test using Snellen VA and it was converted to logMAR for study analysis: counting fingers, hand movements, the perception of light, and no perception of light were assigned values of 1.85, 2.3, 2.6 and 2.9, respectively. The study was conducted in accordance with declaration of Helsinki and ethical approval was obtained from Malaysian Medical Research and Ethical Committee. The primary outcome measure was the visual and anatomical outcome after 1 year post-vitrectomy. Visual success is defined as the final visual outcome of better than 6/12 (<logMAR 0.3) and anatomical success is attaining reattachment of retina post-operatively. Secondary outcome measures were the pre-operative characteristics, post-operative complications, the effect of lens status on visual outcome and the factors predicting the poor visual outcome. All statistical tests were performed using the IBM SPSS for Windows statistical software package (version 20.0; SPSS Inc., Chicago, Illinois, USA). Categorical variables are presented as numbers and percentages, and the Chi-square test was used to compare clinical characteristics among the groups. Independent-samples t-test and Mann–Whitney U-test were used for the analysis of continuous variables when appropriate for comparisons between groups. The predictive factors for poor visual outcomes were identified using univariate analysis. Variables that were associated with poor vision on univariate analysis entered into a model using stepwise logistic regression to identify independent predictors of final vision. For multivariate analysis, the poor visual outcome was defined as corrected vision of 6/60 or worse. Statistical significance was set at P < 0.05 for all the analyses. There were 177 eyes of 164 patients with the mean age of 51.62 ± 10.4 years. The median age at surgery was 53 years; 17% were under 40 and 14.9% were aged 70 or more. The demographic and pre-operative characteristics of the patients are summarised in [Table 1]. Majority of the patients were Malays, male and had Type 2 diabetes. Indian patients constituted 32.9% which is higher than their racial representation (14.9%) in the local population. The most common associated systemic condition was hypertension which was present in 76% of the patients. Hundred and nine (61.2%) patients had a vision of worse than 6/60 in their better eye at presentation. A total of 140 (79.1%) of the eyes were phakic and 37 (20.9%) were pseudophakic. Majority of the eyes (98%) had been treated by pan-retinal laser photocoagulation before vitrectomy. The operative details are shown in [Table 2]. Post-vitrectomy, 91.5% of the eyes had improved or stable vision with the mean logMAR VA significantly improved from 1.73 to 0.82 (P< 0.0001). The anatomic success in this series was 98.3%. Post–operatively, 119 (66.8%) eyes had VA of 6/60 or better. The visual success was 30% where a total of 56 patients had VA of 6/12 or better. [Figure 1] shows the pre- and post-operatives fundus changes in patients with good visual outcome. Overall 124 (74.7%) eyes improved by at least 0.3 logMar units and 15 (9%) worsened by at least 0.3 logMar units. Overall 124 (74.7%) eyes improved by at least 0.3 logMar units and 15 (9%) worsened by at least 0.3 logMar units. 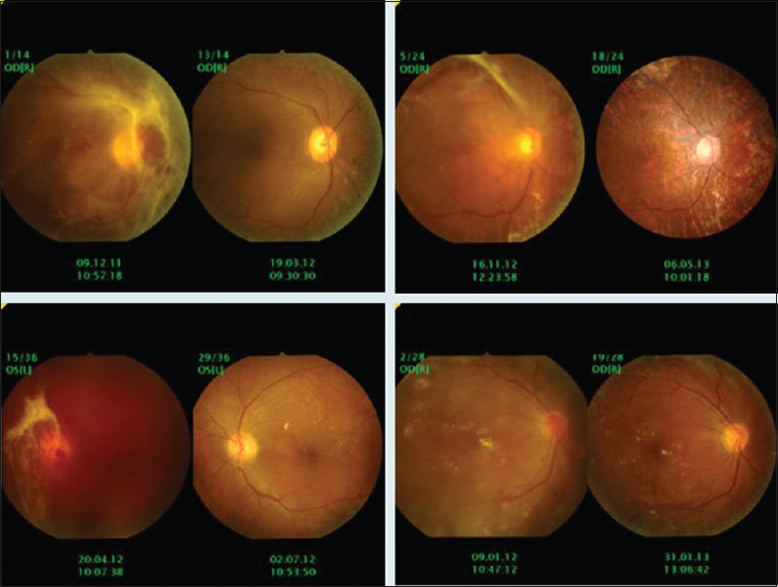 [Figure 2] shows fundus photos of patients with poor post-operative outcome. Thirty-seven (20.9%) eyes had prior cataract extraction. Thirty-two (18.1%) eyes required cataract surgery at a mean of 12.5 months following primary vitrectomy. Seventy-eight (44%) eyes had combined primary vitrectomy and cataract extraction. VA improved by at least 0.3 logMAR units in 73.1% of the phakic eyes and 63% of the pseudophakic eyes (P = 0.22). 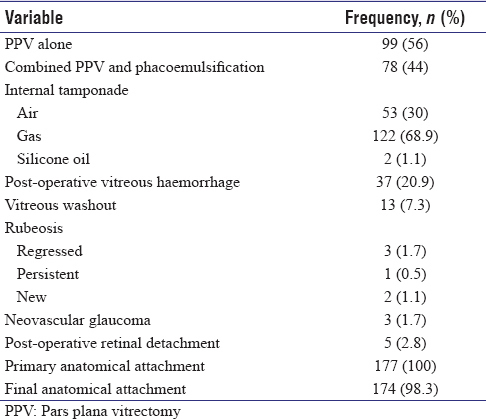 There is no significant difference in the visual outcome for combined phacoemulsification compared to sequential phacoemulsification after vitrectomy (P = 0.32). However, combined vitrectomy and cataract surgery had earlier better visual outcome than the sequential surgery. There were no intraoperative complications recorded. Post-operative complications were persistent vitreous cavity hemorrhage, which was lasting more than 2 weeks (20.9%), rubeosis iridis (3%), retinal detachment (3%), macular epiretinal membrane (3.6%), high intraocular pressure (8.9%) and gas cataract (3.6%). Post–operatively, 63.2% had vitrectomy haemorrhage, with the majority (44.1%) of them occurring on the 1st post-operative day and 7.3% required vitreous washout for persistent vitreous haemorrhage. There was no association between visual outcome and patient's age, gender, ethnicity, duration of diabetes and lens status. Multivariate analysis showed that pre-operative VA of <6/60 in either the operated or the fellow eye, macular detachment and the presence of post-vitrectomy rubeosis iridis were independently associated with poor visual outcome [Table 3]. In this study, 98.3% of the eyes achieved anatomical success and 30% of eyes achieved final VA of ≤0.3 logMAR at the 1 year follow up. These results are better than the DRVS and comparable to other similar studies. A retrospective study with 25 g vitrectomy in Canada also yielded the similar visual and anatomical outcome post-diabetic vitrectomy. As a developing country, Malaysian ophthalmology service has seen a tremendous advancement in surgical techniques, expertise and instrumentation. This study proves that diabetic vitrectomy outcome in our tertiary centre is comparable to UK, Canada and other European countries. We did not find a significant association between age and poor visual outcome. Hence, vitrectomy should be offered to all patients regardless of their age. There is no significant difference in the visual outcome for combined phacoemulsification compared to sequential phacoemulsification after vitrectomy. After vitrectomy, cataract may develop and may lead to a reduction in vision. Older patients with pre-existing nuclear sclerosis may develop visual loss from post-vitrectomy cataract much sooner than the younger ones. Diabetic patients are more likely to have pre-operative lens opacities, compared with other patients of the same age and often experience earlier lens opacities after vitrectomy if gas is used to repair the retina. Combined surgery in most diabetics is safe and allows for early visual rehabilitation with a single surgery. Yorston et al. have reported that poor pre-operative vision, macular detachment and long acting intraocular tamponade were independent predictors of poor visual outcome. Similar to the Yorston et al. study our results also support that poor vision in the contralateral eye similarly increases the risk of the poor visual outcome. This study has identified that presence of iris neovascularisation and preexisting macular lesions are the main predictors of poor visual outcome. Schachat et al. explained that removal of the vitreous allows vasoproliferative factors produced in the hypoxic retina to diffuse forward to the iris and cause rubeosis. The number of blind patients declined from 41 to 16 after 177 operations, implying that one in seven vitrectomies restores sight to a blind person. This supports the previous reports that diabetic vitrectomies are an efficient use of resources to restore sight. To summarise, this study shows that majority of patients undergoing vitrectomy for ADED will regain or retain useful vision. However, surgeons should consider the predictors of poor visual outcome in the selection of patients and provide appropriate pre-operative counselling. Letchuman GR, Wan Nazaimoon WM, Wan Mohamad WB, Chandran LR, Tee GH, Jamaiyah H, et al. 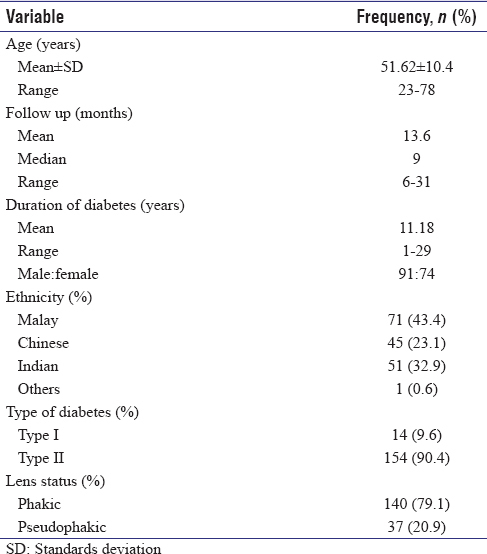 Prevalence of diabetes in the Malaysian National Health Morbidity Survey III 2006. Med J Malaysia 2010;65:180-6. Gupta B, Sivaprasad S, Wong R, Laidlaw A, Jackson TL, McHugh D, et al. Visual and anatomical outcomes following vitrectomy for complications of diabetic retinopathy: The DRIVE UK study. Eye (Lond) 2012;26:510-6. Lemos JA, Carvalho R, Teixeira C, Martins JN, Menezes C, Gonçalves R, et al. Pars Plana Vitrectomy in Proliferative Diabetic Retinopathy–Retrospective Analysis of Results and Complications. Revista Sociedade Portuguesa de Oftalmologia 2017;40(4). Rice JC, Steffen J. Outcomes of vitrectomy for advanced diabetic retinopathy at Groote Schuur Hospital, Cape Town, South Africa. S Afr Med J 2015;105:496-9. Mikhail M, Ali-Ridha A, Chorfi S, Kapusta MA. Long-term outcomes of sutureless 25-G+ pars-plana vitrectomy for the management of diabetic tractional retinal detachment. Graefes Arch Clin Exp Ophthalmol 2017;255:255-61. Schachat AP, Oyakawa RT, Michels RG, Rice TA. Complications of vitreous surgery for diabetic retinopathy. II. Postoperative complications. Ophthalmology 1983;90:522-30. Jackson TL, Johnston RL, Donachie PH, Williamson TH, Sparrow JM, Steel DH, et al. The royal college of ophthalmologists' national ophthalmology database study of vitreoretinal surgery: Report 6, diabetic vitrectomy. JAMA Ophthalmol 2016;134:79-85.